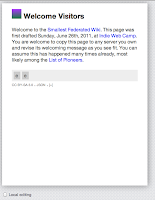 The Smallest Federated Wiki project came up in conversation the other day .. so I had to see how it works. Not much to report yet on the app, but I'm pleased to say the base install is running ... even if I'm running it in a `screen` instead of really daemonizing. I did the RVM install in user space. So, in "Install and Launch" I needed to remove the `sudo` from commands. Seems to be running! Now, to mess with it..